Three girls have died in their sleep – including Jasmine Renata. However only Jasmines details are available at this time – The two other young girls privacy will be respected until their parents wish to talk about it. Those of us who have been watching the devastation the HPV vaccination is having on the lives and families of young girls/women across the globe have also been waiting. 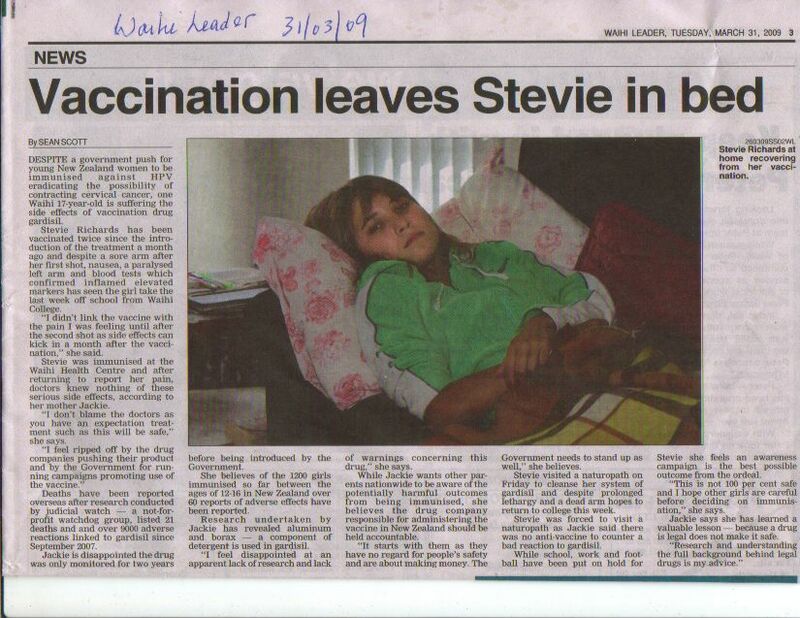 It was just a matter of time once New Zealand bought into the HPV program that we would begin to see the same devastating health affects begin to replicate in our girls; Gardasil was introduced in New Zealand 1st September 2008. On the 9th of July 2008 I wrote an article critiquing TV Ones News report on Gardasil – What TV One news did NOT tell you – They had visited the same sites as I had and yet they chose to omit the growing numbers of death and severe adverse reactions – thus through their calculated and deliberate omissions they gave parents a false sense of reassurance by repeating consistent industry speak about how safe the vaccine was – Instead of warning parents TV one became a mouth piece for pharmaceutical and MoH agendas. She had her 2nd HPV vaccination on the 18th of November 2008 her file states “ok after last injection – no problems” – By January the warts had returned and there were some under her nails which were really painful – the dryness on her hands was still there and she felt dizy at times with pins and needles in her hand – she also suffered “quick bursts of memory lapses and pains in the abdomen . On the 28th of January 2009 she had the warts burnt off her fingers with liquid nitrogen. Her 3rd and final HPV vac was given on the 17th March 2009 and despite the pervious issues the doctor wrote ‘No concerns after 2nd dose, no contraindications. During this time Jasmine was receiving the Depo Provera injection for birth control – at this writing I do not know how this would affect the HPV vaccination if at all excepting that the toxic load from both vacc’s would have been a heavy burden on her system. “Pretty much immediately straight after the third vaccine, Jasmine’s temperament became even more agitated and she was a lot snappier. She complained every so often about a weak arm and tiredness during the day, but we thought that was her doing more shifts for other people than in the past. She slept in the day, whenever possible. However, the arm pain continued and she used to get pins and needles and tingling in her hands for no reason. Jasmine started sleeping in, longer in the morning, and also going to sleep in the middle of the day before her afternoon shift. She started dropping things. She also started to eat more than normal, but wasn’t putting on weight. Jasmine started waking up at night in sweats, and sweating in bed, even when it was a cold pillow, it would be sopping. From June onwards, Jasmine started to complain of feeling clumsy. She started saying things like, “God, I’m getting clumsy!” and she was knocking things over,and dropping stuff. She complained that she was dropping things at work as well. About the same time, we started to notice that Jasmine’s thinking wasn’t right. For instance, she asked me if I’d like her to grate some carrots. I said Yes, please. She got out the grater and the carrot, looked at me, and said, “Which way up does the grater go?” Having grated carrots, cheese and stuff hundreds of times before, that was a surprise. Even jasmine would say something like, “Gee how dumb is that!” This wasn’t a one?off. In other little things too, where in the past she’d just do it, she didn’t seem to know how. It was like re?teaching a child. And then she’d ask me, ‘What should I do with my money this week?” This was a girl who certainly knew what to do with her money in the past. In July, Jasmine intermittently complained of chest pain, and a racing heart. We’d ask her if she was stressed but she said she wasn’t. At the beginning of August, Jasmine got a cold. Normally, her colds might last two days and she had never needed anything for them before this one, but this one just got worse, and worse. She also complained of a sore achy back and abdominal pain. And the warts returned again. Jasmine’s cold never got better, and on 21st September, the day before she died, she was still complaining of a runny nose, which wouldn’t stop. She also had quite a few headaches during that cold, and leading up to her death. Her skin changed, with a lot more pimples than normal, which really upset her. Jasmine also talked about going to have more liquid nitrogen on the warts. In a photo the day before she died, she doesn’t look right. Her hair was lanky and she was very tired. But even so, she was constantly hungry and eating a lot more than normal. Eating more than normal didn’t seem to fit with a constantly tired sick girl, who had had a cold for more than six weeks. On the 22 September 2009. Jasmine Renata Died in her sleep overnight. As of September 1, 2009, there were 15,037 VAERS reports of adverse events following Gardasil vaccination in the United States. Of these reports, 93% were reports of events considered to be non-serious, and 7% were reports of events considered serious. The New Zealand Pharmacovigilance’s Centre for Adverse Reactions Monitoring (CARM) is the agency that monitors adverse effects of vaccinations and medicines in New Zealand. The Immunisation Handbook 2006 requires vaccinators to report all clinically significant events following immunisation to CARM. Adverse events in New Zealand following the Gardasil immunisation are reported to CARM. Doctors are totally dismissive that there is any possible connection with any reaction to Gardasil. • Doctors refused to report the reaction. • Doctors have nothing to offer with regard to treatment. Thank you for your email of 29 September 2008 about monitoring of adverse events following vaccination with Gardasil. CARM had received 10 minor reports of adverse reactions following the Gardasil vaccination. Most reports involved injection site pain while a small number of patients had reported general malaise with symptoms such as fatigue and nausea. Girls started experiencing adverse reactions almost immediately. “The ministry said 230,000 doses of Gardasil had been distributed by November 30 since the immunisation programme began September 2008 for 12- to 18-year-olds……..and……” Up to last month,(November 2009) 236 adverse reactions, including Jasmine's death, had been reported to the Centre for Adverse Reactions Monitoring at Otago University….CARM …..Most reactions were soreness, swelling or redness at the injection site, raised temperatures, headaches, nausea, rashes and fainting……The Accident Compensation Corporation has accepted five claims for treatment injury involving Gardasil, all deemed "minor consequences". To some, these statistics don’t seem that high given the millions of doses that have been administered globally. However if your daughter was one of the healthy vital and often high achieving athletic young girls who died as Rhonda’s was or one of the 7% now presenting with debilitating illness that have eroded their lives the stats would mean didly squat! Even if your daughter was one of the 93% who experienced what they erroneously term “non-serious” reactions such as ‘fainting’ her well being and future health including reproductive health will be of some concern as those ‘non-serious- reactions may now well be precursors to serious long term health problems. Rhonda Renata under advisement was able to put together a comprehensive accounting of her daughter’s symptoms which shocked and upset her. As a mother she had dismissed some of the little things or blamed them on something else. However when put together they revealed a ‘clutch’ of symptoms replicating in hundreds of girls who had had the HPV vaccination. “ I feel ripped off by the drug companies pushing their product and by the government for running campaigns promoting use of the vaccine"
”Why on earth do these pharmaceutical companies put such things as borax (used here in NZ, amongst other things, as ant poison [no longer allowed to the public] and a component of detergent) and aluminum into their vaccines? Madness...? Can the MoH answer that one? “My cousin who is 15 years old had the first Gardasil injection through her school four weeks ago, she fainted at the time of the injection. 2 days after the injection she became very fatigued, had trouble moving her limbs and had swollen glands in her neck. We all thought she had sever glandular fever but she got worse and worse sleeping around 18 hours a day. She was taken to a doctor who tested her for lymphatic cancer and other illnesses and all the tests came back negative, he then believed her to have chronic fatigue. In the beginning none of us put two and two together and then started doing some research into the vaccine and other adverse reactions from women overseas. ?Really we are just trying to establish 'where to from here'. Are there other people in New Zealand who have had similar reactions? Is there anything we can do for her to help her feel better? Is there anyone we can talk to who will actually listen about concerns towards the vaccine? We understand it 'might not' be the vaccine but it's seems like a big coincidence, especially with the uncertainties about the vaccine which are openly displayed in the FDA report. ?…..I hope someone can help." "My 12 year old daughter recently had a scary reaction to her second gardasil shot. Within a few days she started to become uncoordinated [noticed in particular by her ballet teachers] and had a collapse on day five. Over the next week we presented twice to the emergency ,where it was shown that she had symptoms similar to MS. These were left sided weakness and sensation changes, some abnormal reflexes ,an inability to walk straight as well as a severe headache, nausea and dizziness. The hospital did a cat scan [normal] and sent us home telling me the gardasil was not to blame and that it was probably just a bad migraine. After a couple of weeks I was able to see a private pediatrician who immediately consulted with a neurologist who had seen cases of demyelination following this injection. He ordered an urgent MRI which she had several days later. By this stage she was almost fully recovered and thankfully the MRI was normal. Needless to say she will not be having the third injection and I am telling anyone who will listen our story. I am angry that I was not informed about potential side effects as well as kicking myself for not doing the research prior to going ahead with the vaccination. I am of course also worried about potential side effects that may show themselves in the future. My heart goes out to other girls and their parents who have suffered as well and I hope that my story may raise awareness so that parents can make an informed decision". Will the government help ? Who can help these girls ? “The reaction was minimised by a visit to a naturopath which is one and a half hours away. She had one follow up session and I am taking her again next week as her immune system is still shot to pieces. He was fantastic. Please consider using alternatives because the main stream doctors can't help. Our offspring are too precious to be left to fate, so we have to look for alternatives to help make our girls lives better”. "Anyone who has experienced negative side effects from this shot most likely has "heavy metal poisoning"! A lot of the ingredients in this shot are filled with metals like aluminum and mercury which are EXTREMELY toxic to the body. Thankfully, there are ways to rid these metals from your body and detoxify. I am a 17 year old girl and know first hand how damaging Gardasil can really be. After getting all 3 shots I had began experiencing all kinds of unexplained health problems and felt hopeless like I'm sure all of you do, but once I began detoxifying this crap from my body I slowly began to feel better and better until I was completely back to my normal self! Here is my recovery story. - a lot of vitamin c, b complex, zinc, fiber, and magnesium vitamins. Yes he is right – the reason being is that our coroner doesn’t have the tools - In terms of postmortem tests: various stains for dead/dying motor neurons would tell the tale, as well as the Morin stain for aluminum - This would prove a link in both deaths and illness arising from the Vaccination. He is also right because NO medical person of any caliber will admit a connection. This is blatantly untrue – there is a causal relationship – they just don’t want to admit it – admittance would lead to accountability, it would lead to responsibility, which of course would lead to LIABLITY, and none of them want that. In Spain two girls got severely sick and their MoH or government body had at least one person concerned enough to stop the program. An NHS trust today suspended all cervical cancer vaccinations after a 14-year-old girl died hours after being given the vaccine. Coventry Primary Care Trust today said it had halted vaccinations for two days while an investigation into Natalie's death is carried out. The Department of Health has refused to say whether it would still allow tens of thousands of girls across the country to receive the jab in the months ahead. But there were calls for the entire cervical cancer vaccination program to be suspended amid fears parents would now boycott it in the wake of Natalie's death." Given the facts that are emerging it begs the question- Will our MoH or our government act in the best interest of public health and safety and suspend this program in the light of the evidence gathered and growing. Will our main stream media and their reporters start reporting accurate truth or continue with corporate spin? Will primary health sector doctors stand up and voice concern in public or will they dismiss it in favour of skewed and manipulated science as a growing body of evidence is revealing?